Thomas Erikson is an appreciated lecturer with between 120 and 150 performances per year. With his books as a base he lectures throughout Europe. Thomas is working exclusively to develop companies and organizations from a leadership perspective and in the past twenty years, he has trained more than 4,500 executives and leaders to become better and more efficient in their assignments. The international version of this website is under re-construction. 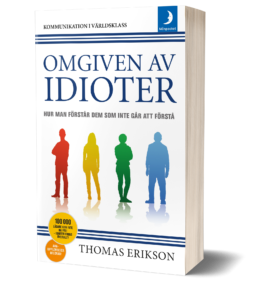 Thomas Erikson has written three popular science books on communication and human behavior; Surrounded by idiots is one of Sweden's best-selling trade books 2015-2018 with over 550,000 copies sold only in Sweden. The sequel Surrounded by psychopaths is about manipulation. Surrounded by psychopaths has been sold in just over 100,000 copies only in Sweden and is currently sold abroad. The third book Surrounded by Bad Bosses has just been released. Thomas is an engaged lecturer with experience to speak to both larger and smaller groups across Europe and give lectures in both Swedish and English. He captures his audience using real psychology wrapped with a good deal of humor.